Edgar’s skill in his flower studies is to catch the innate characteristics of leaves and blooms whilst avoiding any botanical pedantry – a skill analogous to the technique he uses in his portraits. 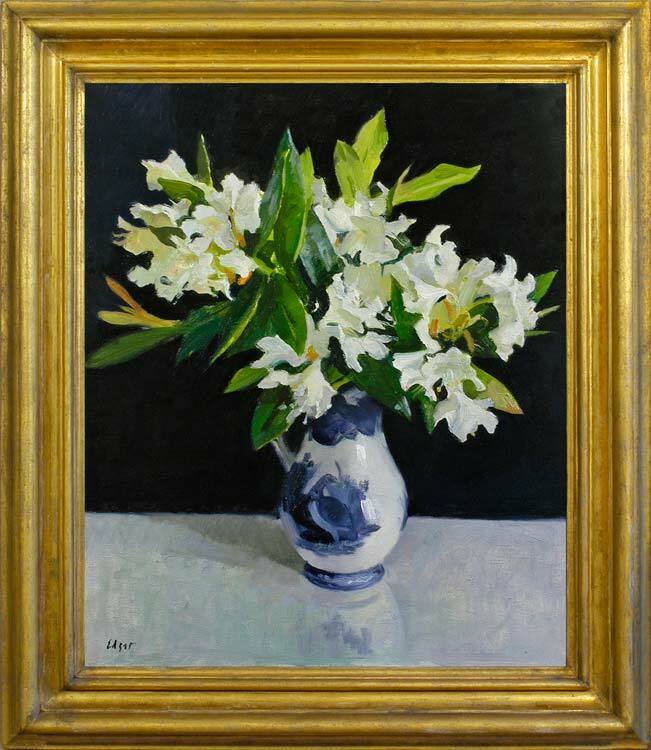 This painting of rhododendrons has the authority of an Old Master flowerpiece, with a looseness and grace which is wholly contemporary. Norman Edgar was born in Paisley in 1948, and studied at the Glasgow School Art (1966-70) under David Donaldson. He later taught art himself, becoming a full-time painter in 1990. He was elected a member of the Royal Glasgow Institute of Fine Art (1991), and in 1993 he became President of the Glasgow Art Club. He exhibits regularly at the RGI and at the Royal Society of Portrait Painters in London, and has had numerous one-man shows. He has been commissioned by private and corporate clients and by institutions, and his work hangs in collections across the world. He produces landscapes, still life paintings and portraits; his portraits of Cardinal Thomas Winning, Archbishop of Glasgow, 1994, and of Winifred Ewing, MEP & MSP, 1999, are in the Scottish National Portrait Gallery.